How beautiful! Did you dye these yourself? No! These are snippets from skeins dyed by the parent handwork teacher at my son's school. I found them in the bag of undyed samples I picked up at school today to order some neutral wool and I had to share. 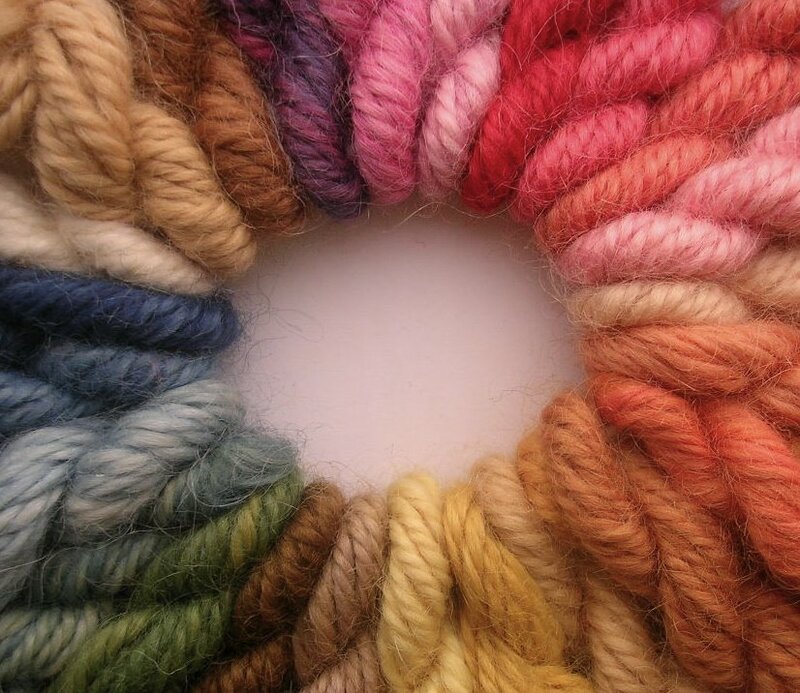 If anything could get fiber enthusiasts out there to try natural dyes, it would be this, don't you agree? You can't just tease us with a photograph we want to know what all the colours are! Seriously though what a great spectrum of colours - just beautiful. What are you planning to do with it? Not even the woman who produced this bunch of samples (don't let your eyes fool you--there's only a yard or so of each color here) could tell you exactly how she produced each one since she is of the "dye as soup pot" school. This just goes to show you what you can do if you start playing around. I mostly know what she uses, so I'll take a shot at labeling each group. Clockwise from the natural sample on the left you see two shades of cutch, cochineal overdyed with indigo for purple, cochineal shades, cochineal and madder for the coral shades like in my recipe for coral in the sidebar, shades of madder mixed with osage orange, the yellows are marigold for the pale and (I think) fustic or weld, then the cooler browns look like cutch tinged with logwood, the green and teal are fustic or weld overdyed with indigo and lastly three gradations of indigo. These are beautiful, as are the words you use: cutch, osage, fustic, weld - a whole new world! Amazing! When we eventually FINALLY meet up - I want it to be a dye day. I've been thinking a lot about dying my own roving. Are you game?